The Place Occupying the space of what used to be Artistry at Jalan Pinang near Bugis, Earlybird Cafe has been officially opened for about six months and I am surprised to find out about it only recently. Managed by the same team behind Revelry Cafe in Bukit Timah, the cafe takes up a pretty charming shophouse space at a corner, greeted by its chirpy yellow signboard at the entrance. The interior is relatively spacious, with a conspicuous mural on the wall with three birds. Other than the notion of the early bird catches the worm, there is also the idea of birds returning to their cosy nest, akin to creating a cosy space for diners to enjoy their food. The Food Coffee first, the team uses Allpress coffee beans, a brand which I am familiar with during my travels in New Zealand and London. The Flat White (S$5.50) for a start has a smooth flavour, with a moderate punch to awake the senses. Brunch offerings are relatively varied. There are popular options like the ubiquitous King’s Brekkie (S$24) and Salmon & Avo (S$22). 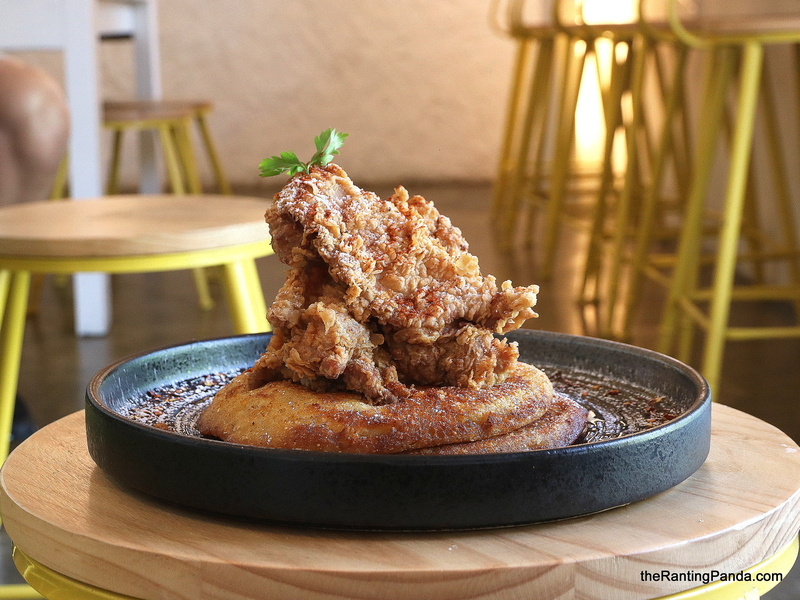 I had one of the signature dishes instead, the Chicken & Pancakes (S$19) which is a twist to the more popular chicken and waffles. It is a huge serving, best to share with someone else. I enjoyed the fried chicken as the meat is pretty juicy and tender, along with the crispy skin. The pancake is relatively fluffy as well, which is buttery enough for me. I also tried the Truffle Shrooms (S$17), where you get a gigantic croissant along with sautéed mushrooms in truffle oil. There is grated parmesan in the croissant, which is crispy and buttery on its own. Mushroom is one of my favourite ingredient and glad to say that this version is quite tasty with hints of truffle oil. For dessert, I had the Strawberries and Cheese (S$17), which is quite a big portion of French Toast stuffed with cream cheese. The toast itself is quite crispy, while the cream cheese could be a little more on the portion for the cheese flavour to be more pronounced. Rants The location of Earlybird is neither near Lavender or Bugis station, which might be a push factor for some. Will I Return Again? The space of Earlybird is cosy and spacious, which makes it an ideal space to have a leisurely brunch. The dishes are generally on point for a cafe, with no GST and service charge.